This is a sequel to The more you know about nuclear power the more you like it, Part 1, where I promised to look at the relative nuclear support amongst print and TV media, scientists and the public. A personal favorite technical source on nuclear power is prof. Bernard Cohen’s textbook The Nuclear Energy Option. While the book is out of print there is a very well-executed online version. For this post we need Chapter 4 Is The Public Ready For More Nuclear Power? While public support of nuclear power has only recently been turning favorable, the scientific community has always been steadfastly supportive. In 1980, at the peak of public rejection, Stanley Rothman and Robert Lichter, social scientists from Smith College and Columbia University, respectively, conducted a poll of a random sample of scientists listed in American Men and Women of Science, The “Who’s Who” of scientists.1 They received a total of 741 replies. They categorized 249 of these respondents as “energy experts” based on their specializing in energy-related fields rather broadly defined to include such disciplines as atmospheric chemistry, solar energy, conservation, and ecology. They also categorized 72 as nuclear scientists based on fields of specialization ranging from radiation genetics to reactor physics. Some of their results are listed in Table 1. From Table 1 we see that 89% of all scientists, 95% of scientists involved in energy-related fields, and 100% of radiation and nuclear scientists favored proceeding with the development of nuclear power. Incidentally, there were no significant differences between responses from those employed by industry, government, and universities. There was also no difference between those who had and had not received financial support from industry or the government. Another interesting question was whether the scientists would be willing to locate nuclear plants in cities in which they live (actually, no nuclear plants are built within 20 miles of heavily populated areas). The percentage saying that they were willing was 69% for all scientists, 80% for those in energy-related sciences, and 98% for radiation and nuclear scientists. This was in direct contrast to the 56% of the general public that said it was not willing. We see that scientists are much more supportive of nuclear power than journalists, and press journalists are much more supportive than the TV people who have had most of the influence on the public, even though they normally have less time to investigate in depth. 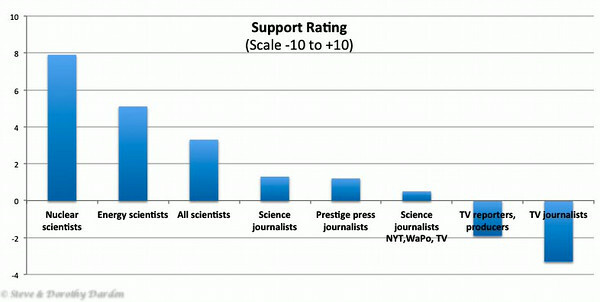 There is also a tendency for science journalists to be more supportive then other journalists. In summary, these Rothman-Lichter surveys show that scientists have been much more supportive of nuclear power than the public or the TV reporters, producers, and journalists who “educate” them. Among scientists, the closer their specialty to nuclear science, the more supportive they are. This is not much influenced by job security considerations, since the level of support is the same for those employed by universities, where tenure rules protect jobs, as it is for those employed in industry. Moreover, job security for energy scientists is not affected by the status of the nuclear industry because they are largely employed in enterprises competing with nuclear energy. In fact, most nuclear scientists work in research on radiation and the ultimate nature of matter, and are thus not affected by the status of the nuclear power industry. Even among journalists, those who are most knowledgeable are the most supportive. The pattern is very clear — the more one knows about nuclear power, the more supportive one becomes. For the 2014 perspective, please read Geoff Russell’s wonderful new book GreenJacked! The derailing of environmental action on climate change. Geoff articulates how Greenpeace, Friends of the Earth, Sierra Club and the like thwarted the substitution of clean nuclear for dirty coal. Those organizations could not admit today what will be completely obvious after reading Greenjacked! : that if they had supported nuclear power from the 1960s to today, then all of the developed world could easily have been like France, Sweden and Ontario province — powering advanced societies with nearly carbon-free nuclear energy. As I was studying the nuclear option, it became blindingly obvious that the people who feared nuclear knew essentially nothing about the subject. Conversely the people who were most knowledgeable about nuclear supported large-scale nuclear deployment as a practical way to replace coal. From reading the recent NEI annual polls I developed an untested hypothesis: the more contact you have with people who work at a nearby nuclear plant, the less you fear nuclear and the more you appreciate the benefits of clean electricity. It’s easy to informally ask your neighbors “what’s the truth?” about things that worry you. And you learn the people who operate the plant are just as devoted to their children as you are. Here is another encouraging trend: there are significant numbers “voting with their feet” by moving into nuclear plant neighborhoods. 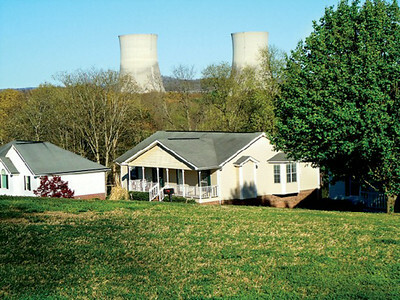 USA 2010 census: the population living within 10 miles of nuclear power plants rose by 17 percent in the past decade. Neighbor of the Sequoyah Nuclear Power Plant “This is a safer neighborhood than most areas and I really don’t think much about the plant, other than it provides a great walking area for me,” said Blanche DeVries, who moved near Sequoyah three years ago. Next we will look at the relative nuclear support amongst print & TV media, scientists and the public The more you know about nuclear power the more you like it, Part 2.